Jesse and I both come from the Sustainable Development PhD Program at Columbia which has once again turned out a remarkable crop of job market candidates (see outcomes from 2012 and 2011). We both agreed that their job market papers were so innovative, diverse, rigorous and important that we wanted to feature them at FE. Their results are striking and deserve dissemination (we would probably post them anyway even if the authors weren't on the market), but they also clearly illustrate what the what the Columbia program is all about. (Apply to it here, hire one of these candidates here.) Here is the second post. Around the world, diesel-powered vehicles play a major role in moving people and goods. In particular, buses are heavily utilized in densely populated cities where large numbers of people are exposed to their exhaust. 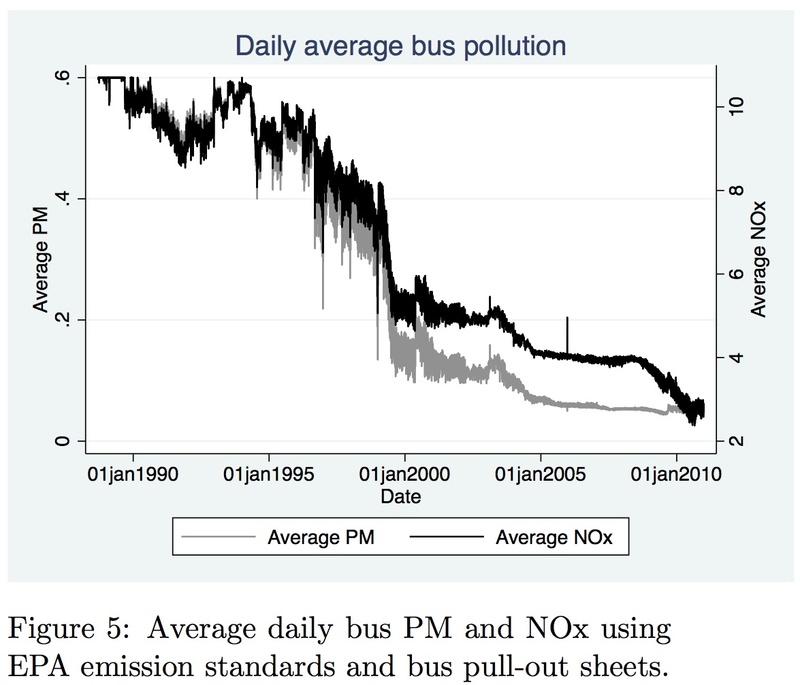 If bus exhaust has an impact on human health, then urban policy-makers would want to know this since it will affect whether or not it's worth it to invest in cleaner bus technologies. Upgrading the quality of public transport systems is usually expensive, but upgrading could have potentially large benefits since so many people live in dense urban centers and are exposed to their pollution. Deciding whether or not to invest in cleaner bus technologies is an important policy decision made by city officials, since buses aren't replaced very often and poor choices can affect city infrastructure for decades -- so its important that policy-makers know what the trade offs are when they make these decisions. Unfortunately, to date, it has been extremely difficult to know if there are any effects of bus pollution on human health because cities are complex and bustling environments where people are constantly exposed to all sorts of rapidly changing environmental conditions. As one might imagine, looking at a city of ten-million people, each of whom is engaged daily in dozens of interacting activities, and trying to disentangle the web of factors that affect human health to isolate the effect of bus pollution is a daunting task. To tackle this problem, we would need to assemble a lot of data and conduct a careful analysis. This is exactly what Nicole Ngo has done. Between 1990 and 2010, New York City made major investments that transformed the city's bus fleet, reducing its emissions dramatically. 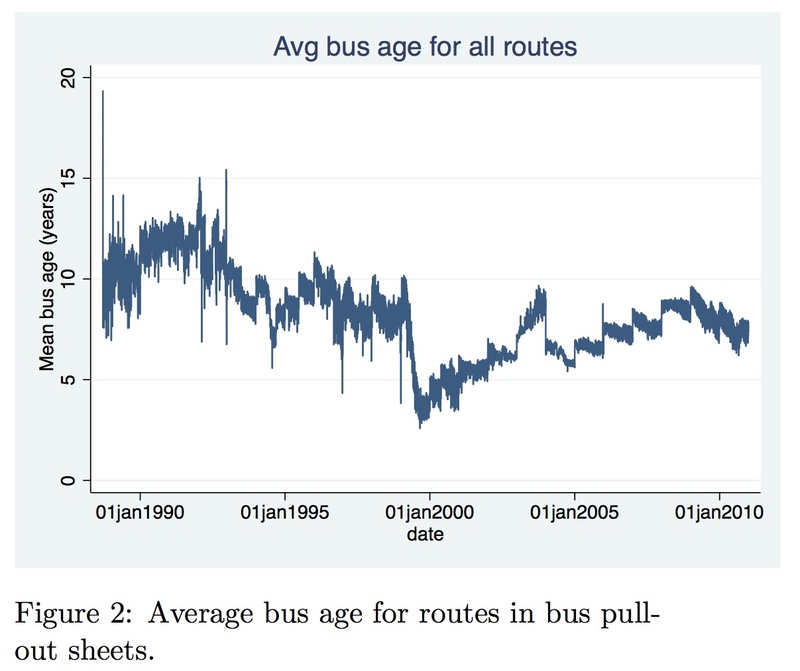 To study the impact of this policy on human health, Ngo assembled a new massive data set that details exactly which bus drove on which route at what time every single day. Because the city's transition from dirty buses to clean buses occurred gradually over time, and because the dispatcher at the bus depot randomly assigns buses to different routes at different times, the people who live along bus routes were sometimes exposed to exhaust from dirtier buses and sometimes exposed to exhaust from clean buses. 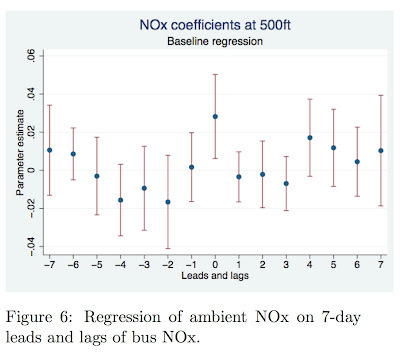 By comparing health outcomes in households that are randomly exposed to the dirtier bus pollution with comparable households randomly exposed to cleaner bus pollution, Ngo can isolate the effect of the bus pollution on health. 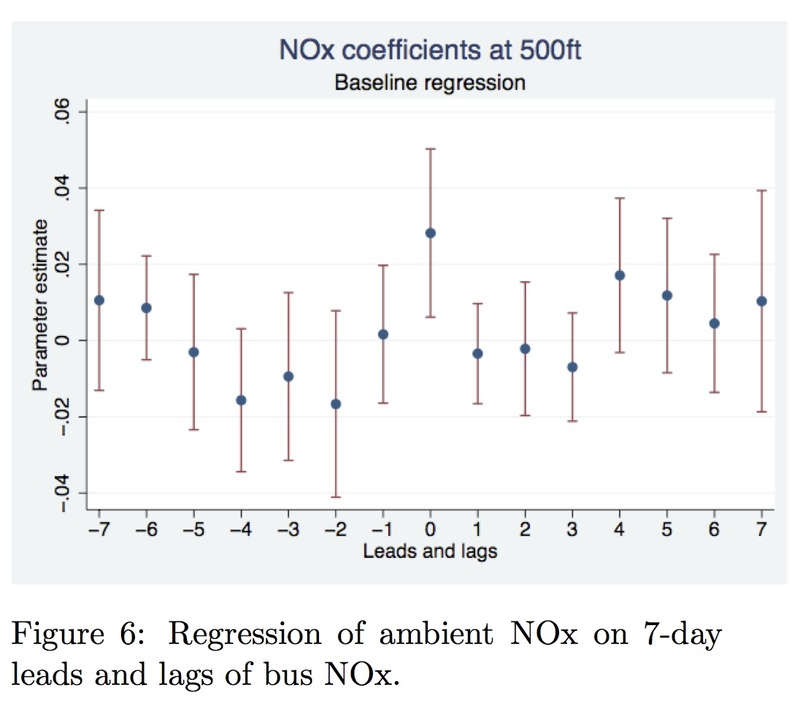 In this paper, Ngo focuses on infant health (although I expect she will use this unique data set to study many more outcomes in the future) and measures the effect of a mother's exposure to bus pollution during pregnancy on a child's health at birth. This is hard problem, since its impossible to know exactly all the different things that a mother does while she's pregnant and because Ngo has to use pollution data collected from air-quality monitors to model how pollution spreads from bus routes to nearby residences. Despite these challenges, Ngo is able to detect the effect of in utero exposure to bus pollution on an infant's health at birth. Fetuses that are exposed to higher levels of bus-generated Nitrous-Oxides (NOx) during their second and third trimester have a lower birthweight on average and fetuses exposed to more bus-generated particulate matter (PM) during those trimesters have a lower Apgar 5 score (a doctors subjective evaluation of newborn health). This [benefit] is likely a lower bound since I do not consider increased hospitalizations costs from lower birth weights as discussed in Almond et al. (2005), nor could I find short-run or long-run costs associated with lower Apgar 5 scores. and I expect that Ngo will uncover additional health benefits of New York City's bus program, which will likely increase estimates for the program's total benefits. Furthermore, I suspect that these estimates for the value of pollution control can be extrapolated to diesel trucks, although Ngo is appropriately cautious about doing so in her formal analysis. These results are important for urban planners and policy-makers in cities around the world who must decide whether or not it is worth it to invest in cleaner public transit systems. In addition, they are an excellent example of how great data and careful analysis can help us understand important human-environment relationships in complex urban systems. Abstract The U.S. Environmental Protection Agency (EPA) reduced emission standards for transit buses by 98% between 1988 and 2010. I exploit the variation caused by these policy changes to evaluate the impacts of transit bus pollution policies on fetal health in New York City (NYC) by using bus vintage as a proxy for street-level bus emissions. I construct a novel panel data set for the NYC Transit bus fleet to assign maternal exposure to bus pollution at the census block level. 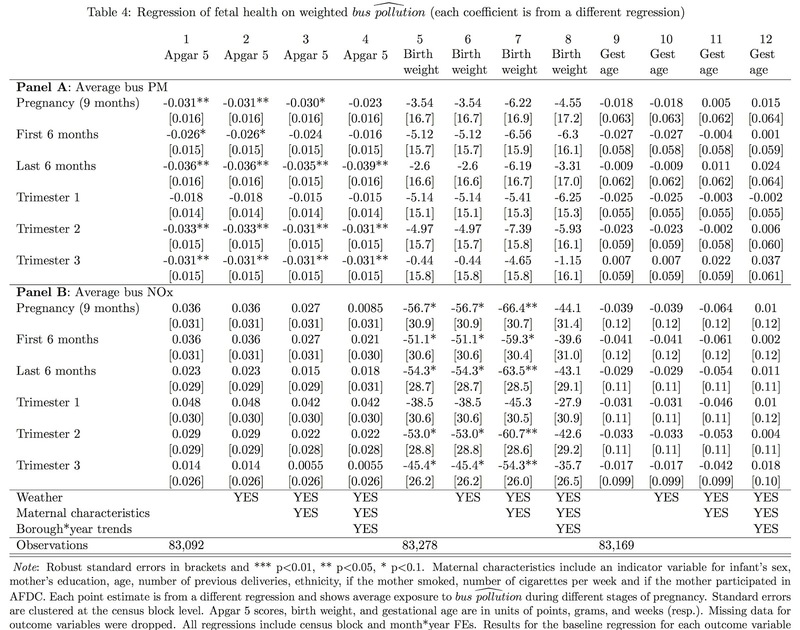 Results show a 10% reduction in emission standards for particulate matter (PM) and nitrogen oxides (NOx) during pregnancy increased infant Apgar 5 scores by 0.003 points and birth weight by 6.6 grams. 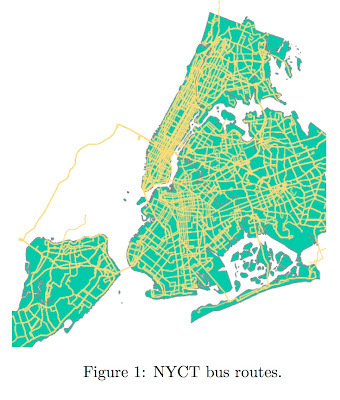 While the impacts on fetal health are modest, the sensitivity of later-life outcomes to prenatal conditions suggests improved emission standards between 1990 and 2009 have increased total earnings for the 2009 birth cohort who live near bus routes in NYC by at least $65.7 million.